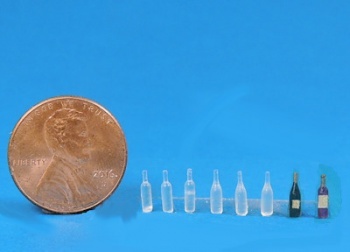 Six tiny clear 3D printed wine bottles. Three in "red" shape and three in "white" shape. Can be easily colored with Bic or Sharpie permanant markers or glass stains. Tiny labels included. You received 6 clear bottles. The two colored bottles in the photo are to show you the finished results.